As many of you are aware, I’m writing another book. The working title is The Ignored Driver of Global Climate: El Niño- Southern Oscillation. I’m about two-thirds of the way done, I believe. There’s lots of new illustrations (so far about 70% are new), and they should help those who are having trouble understanding the processes of El Niño-Southern Oscillation (ENSO). NOAA does not attribute the “significant warming trend” to anthropogenic greenhouse gases, but anytime that phrase is used it implies manmade warming to many persons. Unfortunately, what NOAA has actually done with their changes is minimize the impact of the 1976 Pacific Climate Shift on NINO3.4 sea surface temperature anomalies. I cannot fathom why they would do that when the 1976 Climate Shift is the subject of numerous scientific studies. Google scholar has 176 returns for “1976 climate shift”, in quotes. It is an accepted, well-documented phenomenon. 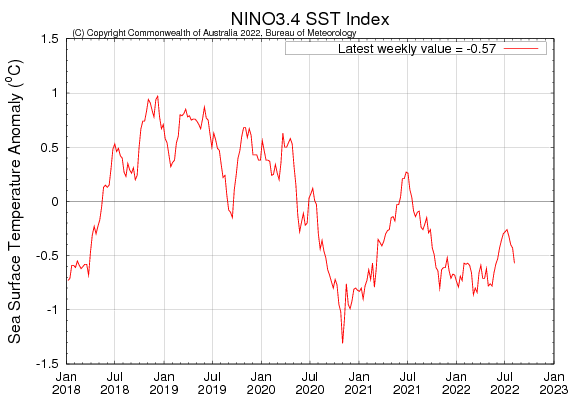 The Oceanic NINO Index is based on the NOAA ERSST.v3b sea surface temperature dataset. Yup, that’s the dataset that NOAA introduced in 2008 with bias-corrected satellite data and then quickly modified, removing the satellite-based data, when “users” at NOAA discovered that the satellite data made global sea surface temperatures in 1998 warmer than 2003 by a couple hundredths of a deg C. Refer to the discussion of Figure 2-23 in Chapter 2. Figure 4-21 illustrates the ERSST.v3b-based NINO3.4 sea surface temperature anomalies, on which the Oceanic NINO Index data is based. The data does in fact have a positive linear trend of slightly less than 0.06 Deg C per decade. Note that I’ve highlighted 1976 to point out the Climate Shift. So let’s look at the data before and after the climate shift. 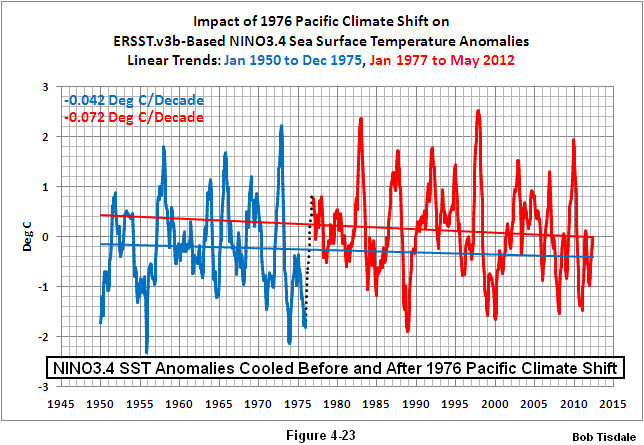 The ERSST.v3b-based period average sea surface temperature anomalies for the NINO3.4 region from January 1950 to December 1975 and from January 1977 to May 2012 are shown in Figure 4-22. The average sea surface temperature anomalies after the 1976 Pacific Climate Shift are about 0.3 deg C higher than they were before it. By the way, that shift impacted the entire Eastern Pacific Ocean, not just the eastern equatorial Pacific. And of course the linear trends before and after the climate shift are negative, Figure 4-23, and that implies the climate shift is responsible for a good portion of the overall positive linear trend from 1950 to present. ONI values during 1950-1955 will be based on the 1936-1965 base period, ONI values during 1956-1960 will be based on the 1941-1970 base period, and so on and so forth. The result: NOAA has eliminated the positive trend in what used to be sea surface temperature anomalies of the NINO3.4 region. See Figure 4-24. One can’t even call them sea surface temperature anomalies anymore with the sliding base years. But for now, we’ll treat them as anomalies. With the changes, NOAA has minimized the difference in the period-average NINO3.4 sea surface temperature “anomalies” before and after the 1976 shift. Based on the “raw” ERSST.v3b data, the climate shift caused NINO3.4 sea surface temperature anomalies to shift up 0.3 deg C, but the “corrections” dropped the shift to about 0.04 deg C, as shown in Figure 2-25. And the changes to the way NOAA calculates sea surface temperature “anomalies” for the Oceanic NINO Index has resulted in more severe negative trends before and after the climate shift. See Figure 4-26. 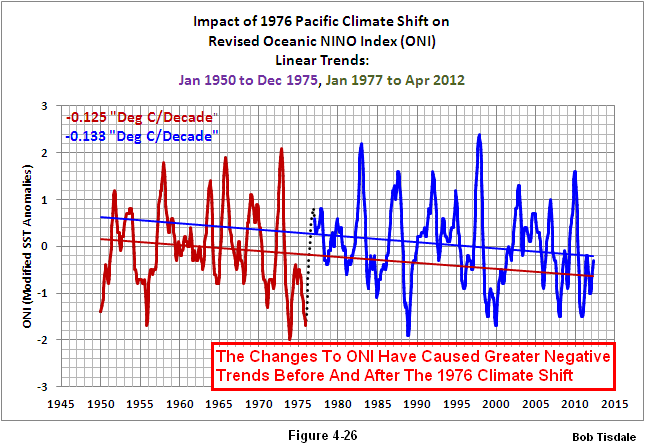 I won’t speculate about why NOAA would want to minimize the effect of the 1976 Pacific Climate Shift. The reason given for the changes seems odd at best. Consider this though: There are scientific studies where the authors remove the linear effects of ENSO on global surface temperatures by simply scaling and subtracting an ENSO index from global surface temperatures. The authors then mistakenly claim the remaining trend in global surface temperatures is the result of anthropogenic global warming. This faulty method of determining the effects of ENSO on global surface temperature is discussed further in Section 6. Now, because NOAA has flattened the Oceanic NINO index trend, if someone were to use it in one of those misleading scientific studies, the remaining trend in global surface temperature residuals would be a little bit higher than if they had used a sea surface temperature anomaly-based ENSO index. In summary, because the Oceanic NINO index no longer represents the sea surface temperature anomalies of the NINO3.4 region using a single base period, and because NOAA has minimized the impact of the 1976 Pacific Climate Shift in it, and because that climate shift exists in all sea surface temperature datasets, I, personally, would not use Oceanic NINO index as an ENSO index. 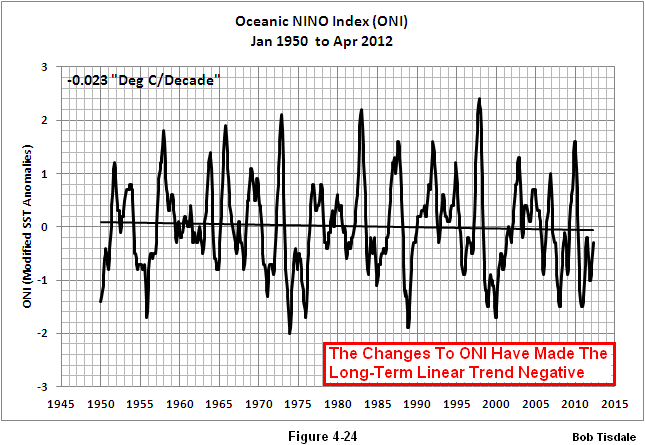 Then again, I don’t believe NOAA cares one way or the other if I use their Oceanic NINO index. This entry was posted in CAGW Proponent Arguments, El Nino-La Nina Processes, SST Update, Weather Event Hype. Bookmark the permalink. I look forward to your new book! [The Ignored Driver of Global Climate: El Niño- Southern Oscillation]. Please let us know when it is available and I will also announce on my weblog. Suspect NOAA has been talking to DOL Monthly Unemployment Statisticians, I guess we’ll be seeing “Corrected” NOAA Data 30-60 days after the BIG Monthly Press Release. The Monthly Data will be touted as Blessed and Proof Positive Justification for Immediate Action and the corrections won’t even get mentioned except on FOXNEWS. Isn’t it very strange what has happened to Science since the kids who learned “New Math” took the reins of power and placed them between their teeth? Best on the new book, Bob! I’m a regular reader and admirer of your cross-posts over at WUWT and I think I’m erudite enough to have taken in most of the technical points. Something I’m not clear on, though, is the at-least-recent trend for Nino 3.4 SST anomalies to increase in the first half of a year and decrease in the second half (with this reversed for the 09-10 Nino). Given that these are anomalies, not absolutes, I wouldn’t really expect to see a seasonal component to the trend, but it’s as clear as day. The lowest anomalies appear in early January, followed by a steady rise until July begins, whereupon a six-month decline starts. Around July/August 2009, during the austral winter, something caused this pattern to flip, setting in course a five-month increase in anomalies until, by January 2010, anomalies were jogged back down. Have you any explanations as to why this pattern occurs? Is there any particularly pronounced variability in inputs after the solstices that determines the course of 3.4 SSTs? 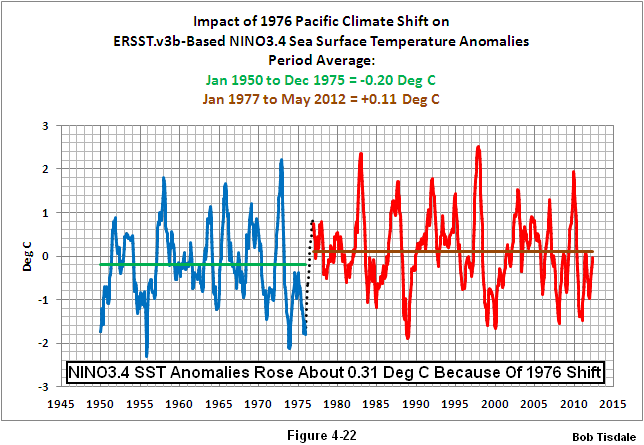 Keith: NINO3.4 sea surface temperature ANOMALY peaks and troughs do align with the seasonal cycle. For El Nino events, it’s a function of the seasonal cycle in sea surface temperatures (not anomalies) in the western Pacific. They peak there in November, appearing to make more warm water available for the Equatorial Counter Current to carry east during the El Nino. The NINO3.4 sea surface temperature anomalies generally peak there a month later during the El Nino. As the seasonal cycle carries the warmer water to the south through March/April, the El Nino decays. On the La Nina side, I believe it has to do with the seasonal cycle in trade wind strength, though I have yet to confirm that. Thanks, I’ll have to include that discussion in the book. Thanks for the reply Bob. So the base from which the anomalies are calculated is the same throughout the year? That’ll explain why the seasonal cycle shows up. I’d have expected the base to vary by calendar month at least, given such seasonal variation, but there you go. Nope. Each grid around the globe has a slightly different average annual cycle in sea surface temperatures, where the average cycle is determined from a given base period. 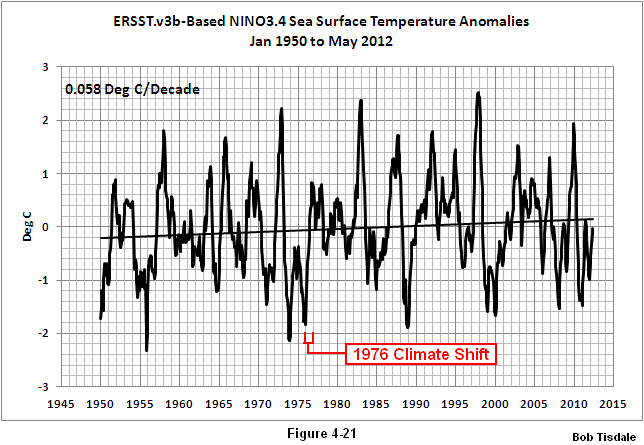 NOAA uses 1971 to 2000 as their base period. The base period average sea surface temperature anomalies for the Januaries of 1971-2000 is then subtracted from the temperature for a specific month (January 2012 for example) to determine the anomalies for that month. 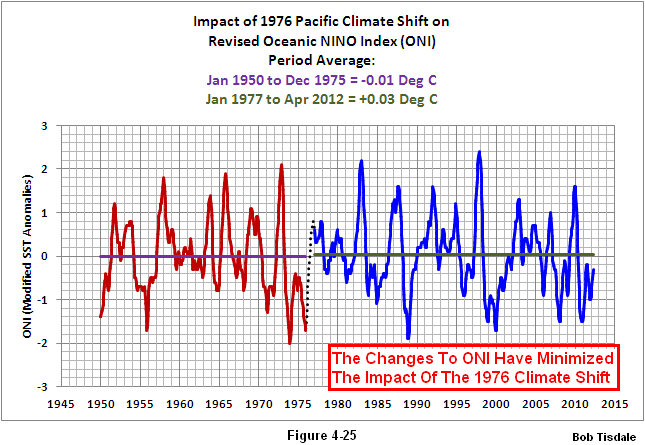 Pingback: NOAA’s Ever-Changing Definition of La Niña Years | Watts Up With That? Pingback: Weak El Niños and La Niñas Come and Go from NOAA’s Oceanic NINO Index (ONI) with Each SST Dataset Revision | Watts Up With That?